The biggest event in soccer and one of the biggest events in all of sports—the FIFA World Cup—will be held in Russia between 14 June and 15 July 2018. It will be the 21st FIFA World Cup. On December 2nd 2010 Russia was awarded the hosting rights. 32 countries will participate, playing a total of 64 matches in 11 cities. The visa policy of Russia will not apply during the competition for those who have purchased a ticket. The general sale will be open until 15 July 2018. Tickets are sold on a First Come First Served basis. You can apply for tickets via the official FIFA website. It's best to plan your stay by booking early as you will definitely encounter higher prices and decreased availability during this popular period. Tip: see our article banners, with a direct link to hotel bookings. In most cities, quality hotels are in abundance in all major cities. International chain hotels like Hilton, Radisson, Park Inn can be present in almost any unlikely location. With international business people exploring every part of Russia for business opportunities, there is no lack in finding a good hotel for your budget. Russian themed hotels are especially a gem for tourists. Explore global hotel sites for finding a good hotel for your budget. Another useful option is short-term apartment rental offered by small companies or individuals. This means that certain flats in regular living buildings are permanently rented out on a daily basis. The flats may differ in their location and quality (from old-fashioned to recently renovated. A new phenomenon has been the development of "mini-hotels" in large Russian cities. Such hotels usually (but not necessarily!) provide clean modern rooms with private baths at far lower costs than conventional large hotels. These small hotels are located within existing apartment buildings and include one, two, or more floors located a story or two above street level. They also often serve breakfast. Saint Petersburg has quite a few with more opening all of the time and some are appearing in Moscow. For more information, please refer to specific hosting cities: Moscow, Saint Petersburg, Sochi, Samara, Kazan, Rostov-on-Don, Volgograd, Nizhny Novgorod, Saransk, Yekaterinburg, Kaliningrad. 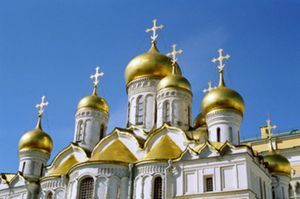 Moscow and Saint Petersburg are served by direct flights from most European capitals, and Moscow also has direct flights from any cities in East Asia, South Asia, Africa, the Middle East, and North America. US non-stop flights from the United States to Russia are offered Yakutia (from Anchorage to Petropavlovsk-Kamchatsky) and Aeroflot (from New York, Washington and Los Angeles to Moscow, Sheremeryevo). United, Delta, and Singapore have cancelled their flights. Please note that there are 3 international airports in Moscow: Sheremetyevo (SVO) in the northwest, Domodedovo (DME) in the south and Vnukovo (VKO) in the southwest. Apart from taxi there is no direct link from DME to VKO or SVO. You will have to use airport express train to then change to subway at the same train station, taking circle (Koltsevaya) line, which would take about 25 min to go to Paveletskaya, Kievskaya or Belorusskaya station, check subway map. Total trip from one to the other airport may take at least 2.5 hours depending on whether you have much luggage, subway delay as such is not a problem. There are airports in all large cities in Russia. Some international service can be found in: Novosibirsk, Sochi, Vladivostok, Kaliningrad, Ekaterinburg. International service to other destinations is much more limited. Local airlines are listed in Get around (will direct you to the Russia article. RZhD Russian Railways (РЖД) runs reliable services across dizzying distances. Eastern and Central Europe are well connected to Moscow and to a lesser extent Saint Petersburg. Moscow is also connected to some surprising destinations throughout Western Europe and Asia. Except for the swish new carriages that run from Moscow to Nice and Paris, the international trains generally offer the same quality of compartment as the domestic trains (see Get around: By train). The Russian word for railway station (Vokzal, Вокзал) is somehow related to Vauxhall Pleasure Gardens, a XIX century London attraction. Toilets in the vokzal are free if you have a ticket for an upcoming train (unlike in Vauxhall, London). Belarus, Moldova and Ukraine are very well connected to Russia with many trains daily from cities throughout each country. Helsinki (Finland) has four high speed trains daily to St Petersburg and one overnight train to Moscow. Riga (Latvia), Vilnius (Lithuania) and Tallinn (Estonia) each have at least one overnight or daytime train to Moscow and St Petersburg. Kaliningrad has a short train connection to Gdynia in Poland and the trains from Kaliningrad to Moscow and St Petersburg pass through Vilnius in the afternoon. Beyond Russia's immediate neighbours and former Soviet dominions, direct trains connect Moscow with Austria, Bulgaria, Croatia, Czech Republic, France, Germany, Hungary, Italy, Montenegro, Netherlands, Poland, Romania, Serbia, Slovakia, and Switzerland. Start your Trans Siberian adventure in Berlin and take The Sibirjak, which connects Berlin directly to a baffling array of cities deep inside Russia: Adler, Kazan, Omsk, Novosibirsk, Samara, Sochi, St Petersburg, Ufa, Yekaterinburg and even Astana in Kazakhstan! Western Europe has a different track gauge from Russia, Finland and the CIS so bogies must be exchanged when the train crosses into the ex-Soviet countries (usually Ukraine or Belarus). This adds a couple of hours to the long wait already encountered for immigration. You can stay on the train as the wheels are being changed so it won't disrupt your sleep too much. During the World Cup there will be a fan train between the host cities. You can only get on the train if you are holding tickets to the matches and you need to request a so called Fan ID. . This Fan ID is necessary to get the visa free entry into Russia and to get access to the free transportation in between the host cities. Just follow the steps on the website in order to avoid problems during your stay. The first round (group stage) will see the 32 teams divided into 8 groups of 4 teams. Throughout its history Russia has had various version of the ruble (рубль), which is divided into 100 kopeks (копеек). The latest manifestation (RUB, replacing the RUR) was introduced in 1998 (although all notes and first issues of coins bear the year 1997). All pre-1998 currency is obsolete. Coins are issued in 1, 5, 10, and 50 kopek and 1, 2, 5, and 10 ruble denominations. Banknotes come in RUB5, RUB10, RUB50, RUB100, RUB500, RUB1000, and RUB5000 denominations. The RUB5 note is no longer issued or found in general circulation. The RUB10 ceased being printed in 2010 and will suffer the same fate. Both remain legal tender. Kopeks are generally useless, with most prices given to the nearest ruble. The 1 and 5 kopek coins are especially useless: even places that quote prices in non whole rubles will round to the nearest 10 kopeks. From 1998 until approximately 2012, the ruble enjoyed relative stability, but has become rather more volatile in recent times, and towards the end of 2014, suffered a significant and sudden decrease in value, especially compared to the dollar, euro and pound. All banknotes have special marks (dots and lines in relief) to aid the blind in distinguishing values. Forget about travellers' cheques (only some banks, such as Sberbank, will cash even American Express, but it does so without commission), and bring enough cash to last you for a few days, as occasionally communications networks handling ATM and credit card transactions are not available (as elsewhere in the world). Russian law forbids payments not in rubles. Fortunately, currency exchange offices (called bureaus in Saint Petersburg) are common throughout Russia. Banks and small currency exchange bureaus offer very good rates; hotels are generally expensive and thus not recommended. You need to show your passport at banks. Be sure to take your time to count how much money you got — different ways are sometimes used to trick the customer. ATMs, called bankomats, are common in large cities and can generally be found in smaller cities and towns. Though some may not accept foreign cards. English language interface is available. Some may also dispense US dollars. Russian ATMs will often limit withdrawals to about USD1,000 per day. Big hotels are good places to find them. Visa and MasterCard debit/credit cards of all levels are the most common way of non-cash payment in Russia, and all establishments having a POS terminal, which are now widespread even in small towns, accept them without any problems. American Express, Discover, Diners Club and other cards are rarely accepted. Museums and sightseeing places, especially in small towns, mostly take only cash, no credit cards (with an exception of major museums, such as the State Hermitage and the Vladimir Suzdal Museum Reserve). Have plenty of cash on hand each day to cover entrance fees, photographic fees (many museums charge a fee for cameras and video recorders, however this practice gradually becomes obsolete), tours, souvenirs, meals and transportation. Train Stations may accept plastic, even outside the big cities, be sure to ask as it won't always be obvious. Otherwise take plenty of cash. ATM machines at train station are popular and often out of cash, so stock up before going to the train station. Like anywhere in the world, it's better to avoid street ATMs (or at least to be very careful), as sometimes swindlers attach spy devices to them, to get your PIN and card details; the safest option is the ATMs in hotels, banks or big shopping centres. Besides watching the soccer, there is a lot of other things you can do in this country. The Hermitage Museum in Saint Petersburg is the true star, with an enormous collection amassed first by the wealthy tsars (particularly by its founder, Catherine the Great) and later by the Soviets and the Red Army (which seized enormous treasure from the Nazis, who in turn had seized their bounty from their wars around the globe). Or what about the Hermitage Museum, and the Armory in the Moscow Kremlin. Or particularly famous churches and monasteries like the Saint Sophia's Cathedral in Novgorod, or the fascinating Old Cathedral of Königsberg (home to Immanuel Kant's tomb) in Kaliningrad. For those interested in the grisly end of the Romanov family of Nicholas II, perhaps inspired by the story of Anastasia, look no further than the Church on the Blood in Yekaterinburg, built on the spot of his family's execution. 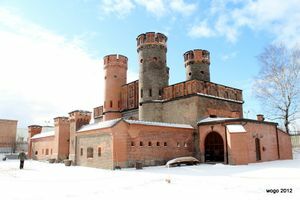 For military buffs, a visit to Mamaev Kurgan, the museum complex at Volgograd is an excellent destination. 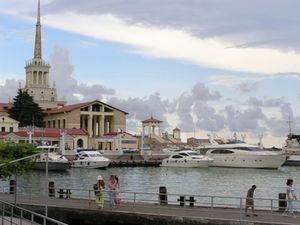 Favorite Russian resorts in the area include those at Sochi (which hosted the 2014 Winter Olympic games) and and is one of the host cities. As you go further east in the North Caucasus, the landscapes become ever more dramatic, from the lush forested gorges and snow capped peaks of Chechnya to the stark desert mountains of Dagestan, sloping downwards to the Caspian Sea. Throughout the entire country, there are over a hundred National Parks and Nature Reserves (zapovedniki). The former are open to the public, and considerably more wild and undeveloped than you would find in, say, the United States. The latter are preserved principally for scientific research and are often not possible to visit. Largely because of the transition from state socialism to market capitalism, Russia did experience a rise in criminal activity during the 1990s. As those who controlled capital through the state had to reconfigure their business operations towards a free enterprise rationality, profiteering and scams have increased. The truth is that much of the violence was contained within the criminal groups themselves and has declined since the 1990s so that, for the average tourist, Moscow, Saint Petersburg and the rest of Russia are actually just as safe as most major European cities, if not more so. You should be noted that Russia is a pioneer country in fighting against narcotics. Russia has a well-developed anti-narcotics enforcement system as well as a set of regulations against uses and carrying of narcotics as tough as Hong Kong and Singapore, drug-trafficking into Russia can be brought a sentence of at least several decades. The crime rate is definitely lower than in New York or London or Paris, but it is always advisable to being cautions and be aware of the crooks and people offering accommodation or selling things. Russia's law enforcement in large cities are well-trained but don't expect English to be spoken by the police outside of large cities. At best they would know a couple of words of German. Do not attempt to give policemen a bribe as you will be charged with bribery. 03 - emergency medical aid. Operators are not fluent in English, and typically only speak Russian, so expect a language barrier if you don't know any Russian. 2gis official website - Cities information service. Available online and as standalone application for desktop, laptop, iOS, Android, Windows Phone. Useful to find the location of desired address, find the desired company information, find the transportation from one location to another. There are 5 GSM operators in Russia, which all use the 900/1800 MHz standard for 2G, 900/2100 MHz standard for 3G, and 800/2600 MHz standard for 4G/LTE, the same as Europe and Asia. Check that your phone supports one of these standards before bringing it to Russia. The 5 operators are Beeline, Megafon, MTS, Tele2, and Yota. There is also one CDMA network: Skylink but you need to purchase a Skylink phone to use this network. All carriers offer cheap SIM cards with data plans that are always a better alternative to paying roaming charges. Megafon is considered to have the best coverage but Beeline is considered to be the cheapest. If you buy a SIM card in a shop, you'll need your passport for identification and it will take around 5 minutes to complete the required paperwork. If you don't speak Russian, you will need to find someone who speaks English. Alternatively, you can buy a SIM card from automated kiosks in metro stations. Calls to landlines from mobile phones are more expensive than calls to other mobile phones, especially those that use the same network. Incoming calls are free from any directions, if you are staying in the same region where the SIM card has been bought. You can add value to your card at the stores of the company you are using, at automated kiosks, terminals, and ATMs (particularly, Sberbank ATMs allow to pay to Russian cellular operators by cash without any bank commission, this is one of the best variants, considering that they are widespread even in small towns and have an English interface, but, of course, it's only about those ATMs which have a bill acceptor). You can buy a prepaid card for international calls, but online services such as Skype are often cheaper. If you want to connect your laptop or computer to a data network, you can also buy cheap SIM cards for a USB-modem. Since the beginning of the 2000s broadband Internet has become widely available in Russia even in the countryside. Almost all places where you can find a computer have a connection at least through ADSL. In towns and especially big cities free Wi-Fi can be found in cafes, hotel receptions, and other public places. Note that since 2015 you must pass an identification procedure by providing your mobile phone number registered in Russia (country code +7) before using free Wi-Fi hotspots. Wi-Fi is also available in some of the newest trains, but in most cases it allows free access to local resources only, and Internet connection requires a separate payment depending on desired time ranging from 1 hour to unlimited access till the end of your route. Internet signal is usually received from hybrid 3G/satellite network and sometimes can be unstable due to outdoor conditions. 3G/4G through a local SIM card is now the best variant of mobile Internet connection in Russia when there is no free Wi-Fi nearby. The coverage is pretty good within urban areas (in the vast Russian countryside base stations with 3G/4G capability are relatively scarce, however the situation is improving every year), and the tariffs are some of the cheapest in the world. Medical facilities in general vary. A majority of hospitals are extremely well equipped, clean, and possess all of the latest technologies. Ensure that all of your vaccinations are up to date, and you have sufficient amounts of any prescription medicine you may be taking. Pharmacies are common in major cities and carry quality medications. Quality of tap water varies around the country, and may even be variable within cities. In old buildings tap water can be non-potable. In the big cities of European Russia, the water is clean of biological contaminants. If you can't buy bottled water, boil water before drinking, or better yet use a special filter for tap water, which you could buy in any supermarket. Besides local doctors (generally good quality but often working in poor facilities) there are medical centers in major Russian cities. These all have different policies for payment (some take credit cards, some require payment in cash up front, even if you have insurance) so make sure you know what you are paying for (and when and how) before you agree to any services. Be careful not to buy fake vodka, which can be dangerous (seriously here, 'dangerous' doesn't mean 'strong'; it can contain methanol, which can make you blind). Only buy vodka in large stores or specialized ones in Moscow, with the sticker over the cap and/or the region's barcode on the side. This page was last edited on 15 July 2018, at 17:22.